Through the use of BIOCINARATOR all very slow degradable materials are disposed off properly where it is generated. So there is no waste accumulation in the treatment plant. The wastes generated from different sources on different occasions are collected and brought together at a particular point and then treated by applying any one of the treatment technologies. In these conditions, 40-50% of the accumulated waste could only be treated properly. The remaining wastes will be heaped up or dumped after classifying as untreated wastes. These accumulated wastes in due course will lead to serious problems of environmental and atmospheric pollution. The integrated waste treatment plant is designed in such a way to enable the treatment of wastes of different kinds without causing any harm to the nature. The wastes of different compositions are converted into useful products by adopting different treatment technologies. As the waste water left out of the plant after the treatment process is being fully reutilized, there is no possibility of waste water flowing out side of the plant area. The non-biodegradable materials are initially collected in separate bins and then converted into other products by recycling. The non-biowastes collected in small sized plants after having filled up to a fixed level are transferred to recycling institutions. The Bio Waste Treatment plant working with bio methanation technology is suitable to treat fast and slow decomposing bio degradable materials like fish waste, meat waste and food waste materials, waste water and slow degradable materials like vegetables and all green or wet plant parts also. With the help of bio methanisation it is not possible to treat effectively the very slow degradable waste materials like dry leaves, coconut husk, and other types of dry plant waste, paper etc. To treat very slow degradable materials in centralized waste treatment plants, aerobic composting and vermi composting are the methods commonly in use nowadays. During this treatment process around 60-70% waste is being treated and balance waste is remaining as untreated. This is accumulating in and around the plant area. So in this system more area is required for collection and keeping of wastes before and after the treatment process. To prevent and to overcome the accumulation of non treated waste, new technologies have to be introduced. BIOTECH - developed a new incineration system namely BIOCINARATOR- working with the utilization of bio gas as operational fuel. This system is capable of treating very slow degradable waste materials generated daily at source. Through this technology bio-mass waste materials like dry leafs, coconut husk, and other types of dry plant, waste paper etc. can be disposed through burning under controlled conditions in a concealed chamber. This process does not require any external fuel. The power generation project is commonly implemented in markets and slaughter houses under the control of local self governing Institutions. The gas generated every day in these projects is not fully required for power generation. Excess biogas available is burned out daily with the help of special flairs designed by BIOTECH. After the invention of BIOCINARATOR, the excess gas generated in these plants can be effectively utilised as a startup fuel for operation of BIOCINARATOR. There is a heat recovery system attached with BIOCINARATOR. The heat generated during the working of BIOCINARATOR can be used for generating hot water. 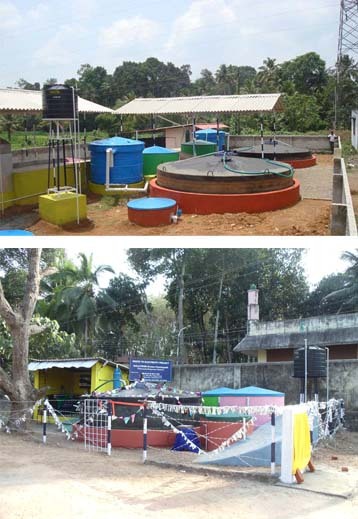 The bio gas generated from the bio-waste treatment plant can be utilized as fuel for the operation of the unit. The hot water generated during working of BIOCINARATOR can be utilized for the effective feeding and operation of biomethanation digester and pre-digesters of the bio waste treatment plants. The biomass materials collected from different locations through road sweeping, are kept in the storage platform of BIOCINARATOR after sorting, for the removal of non- degradable materials like plastic, glass, metal, chemical or medical waste, if any. Five different bins are arranged near the BIOCINARATOR for the safe and hygienic storage of non degradable materials like plastic, glass, metal and for the storage of different types of chemical wastes like damaged fluorescent lamps, used batteries, damaged electric and electronic equipments (E-waste) etc. and one bin for the collection of ash generated during the operation of BIOCINARATOR. There are two input lines to the burner of BIOCINARATOR. One is biogas from the biogas plant and another is the air flow line from the air tank fixed with the BIOCINARATOR. The beginning of the operation of BIOCINARATOR commences with the ignition of the burners in side the burning chamber after opening the valves of biogas. Along with biogas, controlled air flow is also opened to the burners. Biomass materials feeding the BIOCINARATOR through feeding chamber will get fired slowly. Once the BIOCINARATOR is heated and started functioning well, the flow of bio gas is controlled. There is no need of the regular flow of biogas during the entire operation of BIOCINARATOR. The flow of air is continued through out operation of BIOCINARATOR. The cold water storage tank fixed at the top portion of BIOCINARATOR is got heated during the operation of BIOCINARATOR. There is separate provision to discharge heated water and recharge cold water as and when required. The smoke generated at the time of operation of the plant is passed out through the vent pipe. The existing Ash can be collected from the bottom of the plant with the help of a collection tray. The ash generated during the operation can be collected from BIOCINARATOR. This is kept in the ash collection bin available with the plant and can be sold as biofertilizer along with the organic manure generated from the pre-digesters. There is a chance for the emission of hazardous gases in the operation of conventional type of incinerator but there is no chance for the emission of any hazardous gases from the BIOCINARATOR, because the materials like plastic or rubber related waste materials or any other chemicals are not fed to the plant for disposal. The feed materials are wood related waste materials only. Through the use of BIOCINARATOR all very slow degradable materials are disposed off properly where it is generated. So there is no waste accumulation in the treatment plant.